Landslide mapping back in state budget - After the torrential rains of June and its attendant tragedies, the North Carolina General Assembly reinstituted state support for mapping potential landslide risks. Having dropped funding for such efforts in 2011, the legislature allocated $3.6 million toward new studies, especially in the mountains. Appalachian Theatre on track for 2019 curtain call - After years of raising interest, funds, and other forms of support, the Appalachian Theatre in downtown Boone is moving ahead with plans to reopen in late summer 2019. Born as a venue for live shows in 1938 then serving as a movie theater from 1950 to 2007, the venue’s new programming will include plays, concerts, lectures, films, and other cultural events. 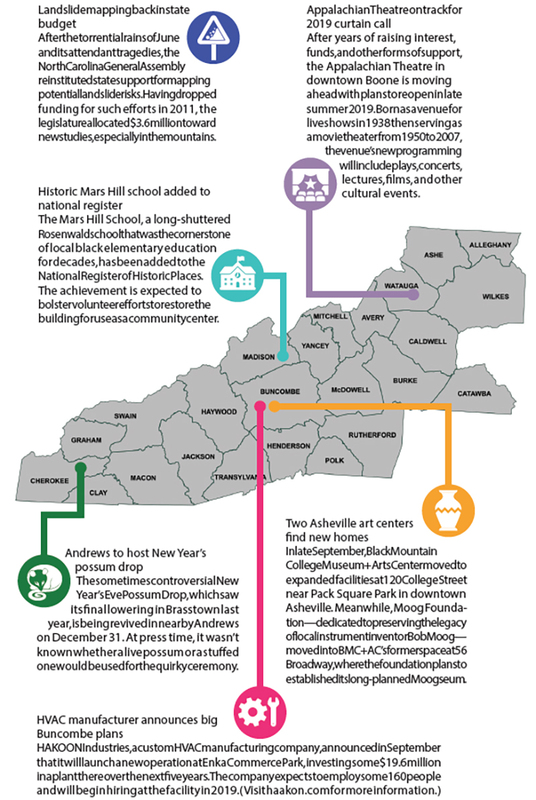 Historic Mars Hill school added to national register - The Mars Hill School, a long-shuttered Rosenwald school that was the cornerstone of local black elementary education for decades, has been added to the National Register of Historic Places. The achievement is expected to bolster volunteer efforts to restore the building for use as a community center. Andrews to host New Year’s possum drop - The sometimes controversial New Year’s Eve Possum Drop, which saw its final lowering in Brasstown last year, is being revived in nearby Andrews on December 31. At press time, it wasn’t known whether a live possum or a stuffed one would be used for the quirky ceremony. Two Asheville art centers find new homes - In late September, Black Mountain College Museum + Arts Center moved to expanded facilities at 120 College Street near Pack Square Park in downtown Asheville. Meanwhile, Moog Foundation—dedicated to preserving the legacy of local instrument inventor Bob Moog—moved into BMC+AC’s former space at 56 Broadway, where the foundation plans to established its long-planned Moogseum.